DERMOT SIMPSON WAS Donegal’s All-Ireland winning physiotherapist in 2012 and this week he examines the pitfalls of over-training and how FC Barcelona calculate the risk. “I don’t think many people will argue that FC Barcelona are one of the top footballing teams in the world. Their medical set-up also falls into the world class bracket,” Dermot says. “I’ve attended the last two medical conferences organized by the club at the Camp Nou. They have been very open about how they approach conditioning and general management of the players. At last year’s conference, Dr Ricard Pruna, their first-team doctor, talked about the 2008/09 season where they had a total of six injuries all year. “Yes, this was the same year they won La Liga, the Copa Del Rey and the Champions League, beating Manchester United in the final at the Stadio Olympico in Rome. “Obtaining that stat is remarkable and is something is unlikely to ever happen again. Preventing injuries requires many things to fall into place and excellent working relationship between management, medical team, strength and conditioning and the players themselves. “Aside from those relationships, factors such training type/duration, lack of recovery/sleep, muscular fatigue, stress/mood levels of players, surface, previous injury history, match intensity, warm-up routines, compliance with gym/injury prevention programmes, all have a huge bearing on risk of injury. “Uefa studies also show that the most successful teams have the lowest number of injuries. This applies to all sports. Dr Pruna of Barcelona has been the doctor for over 20 years and he believes the number one risk for injuries is over-training the players. I would agree 100 per cent. “Preventing injuries from over-training doesn’t mean low intensity training as lower levels of fitness leads to an increased risk of injury! It’s about finding the optimal training load for each player and adjusting training to suit the player’s needs. This can mean high intensity with shorter duration or adapting training to positional demands. A central defender doesn’t need the same training as a left winger. “Monitoring player or team training loads can be done by every team. There are simple but very reliable ways to measure it. Asking the player or team (less time demanding with smaller teams) how difficult the training was is one. This is calculated out of 10 and is multiplied by the training or match duration. “For example, 8/10 difficulty multiplied by 60 minutes equals 480. That number alone means very little. It’s the week to week changes in training loads, as well as total weekly and monthly loads that matter more. Gradual weekly progressions of 10-15 per cent would be acceptable but anything over that increases the risk of injury. “That has been proven in many research studies. Much more complex equations and different ways of monitoring training load (GPS, wellness questionnaires) are also used but they’ll not be discussed this time! “When a player is over-trained, one of two things will occur: A decrease in the player’s performance, or an injury. The coach can be free to adjust the calculating variables (intensity and duration) as long as the calculation is within the accepted total weekly load (< 2,200) and shows less than 15 per cent of a week to week change. “Although there are exceptions (returning too early from injury, low fitness levels, collision injuries among others), muscle injuries should be termed a ‘training error’. Muscle injuries don’t always occur from the current or preceding session. Oftentimes, an accumulation of fatigue is built up from the previous two to three weeks training/matches. Dermot Simpson (pictured above) is a physiotherapist currently working at Aspetar, a world renowned sports medicine clinic in Doha, Qatar. 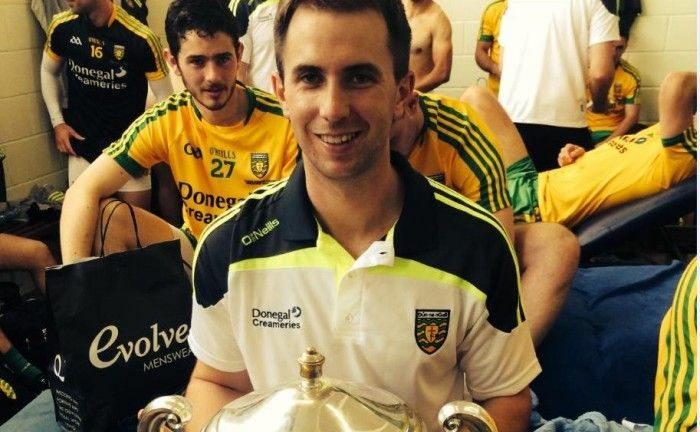 Dermot has been team physiotherapist for Donegal senior football team from the 2012 to 2015 seasons. He will write articles on sporting injuries, injury prevention and rehabilitation for Donegal Sports Hub. Dermot’s website is donegalphysio.ie and he can be contacted on Donegal Physiotherpay Facebook.